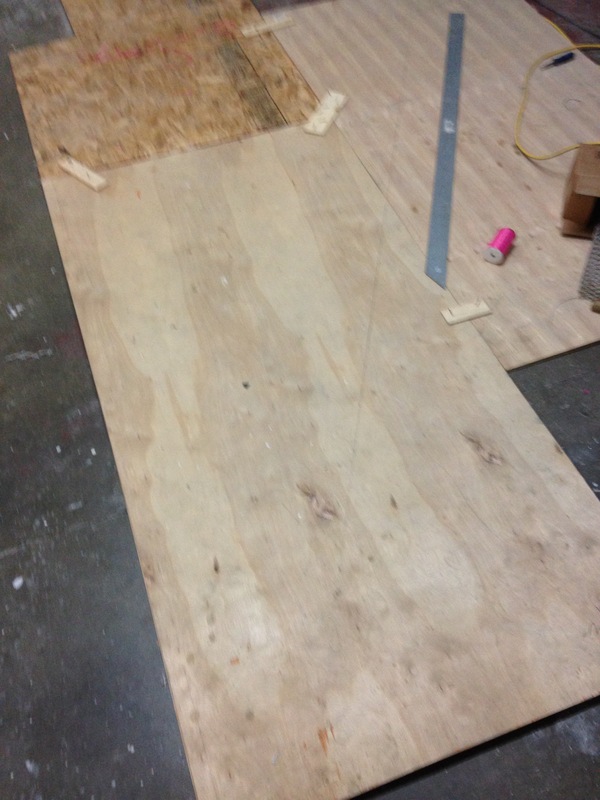 We found step one is to transfer the measurements to the ground with nails/screws/pegs every foot along the outline. We subtracted two inches from each side to give lacing-to-boat room. The netting is cut with a hot knife. Get a good one for this, and heed the 15second current flow warning. We subtracted the two inches all around but added back one row of squares/diamonds for capturing a bolt rope. 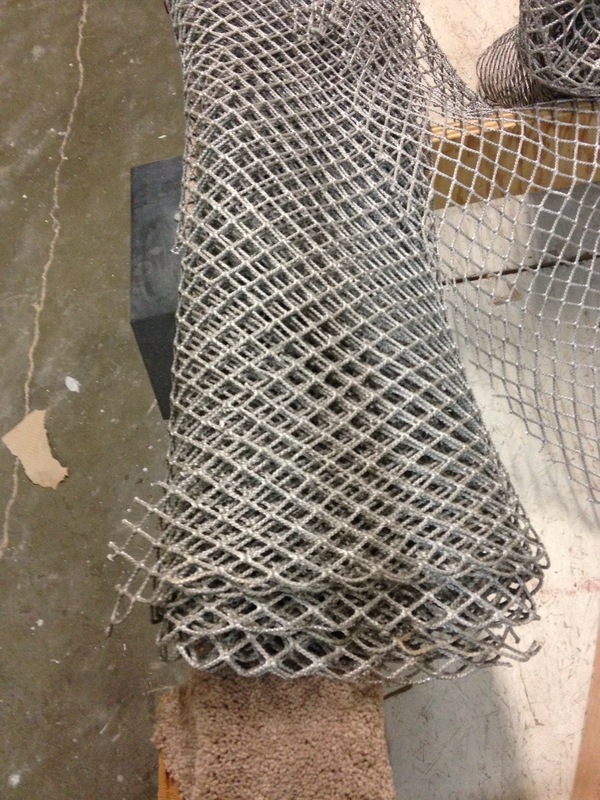 Roll over that single row edge, like up the pattern, and weave the bolt through the net. Next we positioned the net with zip ties! (Great idea Dean and Carlos). 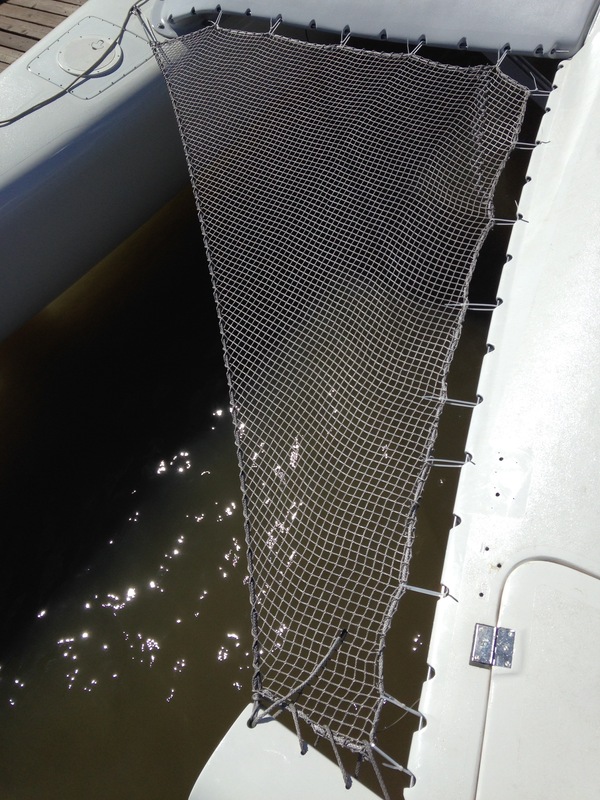 We took two passes of the lashing line through each eye slot on the boat, which helps keep the bolt rope in the net fairly straight. The black line is a Samson 5mm utility double braid. 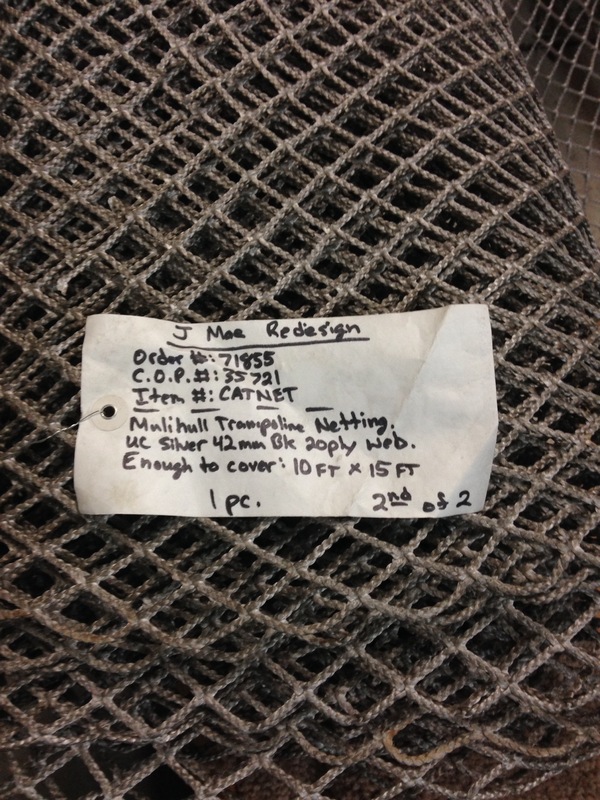 We used up a 300′ roll for all four nets. 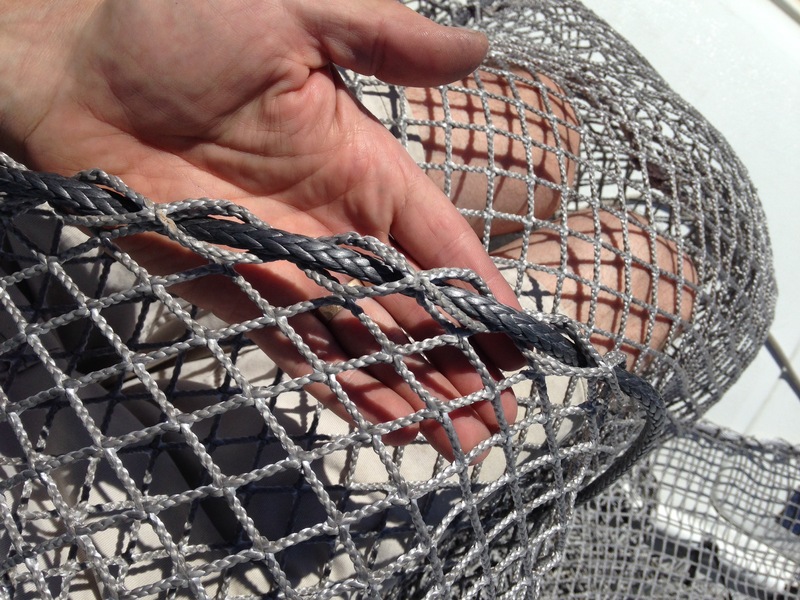 Long continuous runs make each net easily adjustable. Great project for the ambitious DIY-er! 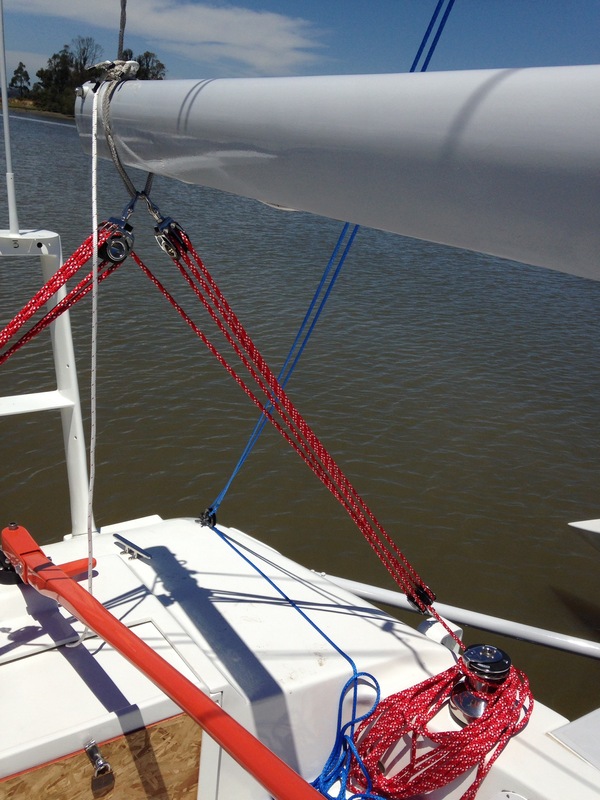 We fitted the boom and sorted out various fittings – gooseneck, outhaul, reefing technique, etc. 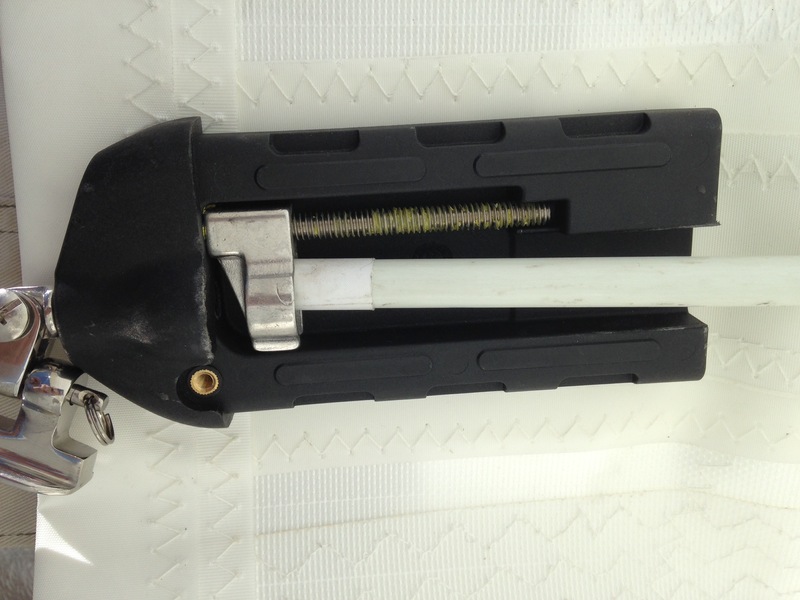 Keith, we respliced the upper back stay terminal to match the end of the lowers – all good now. 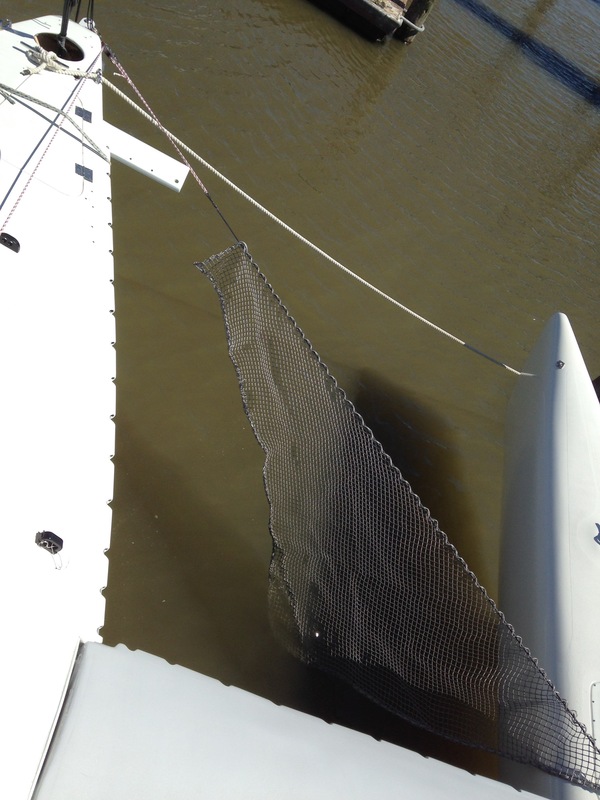 And here you can see our Leneman “Delta Vee” main sheet. The red is all one line with a cross-over leg (see the middle path of the left hand triple upper block feeding the double on the lower right). 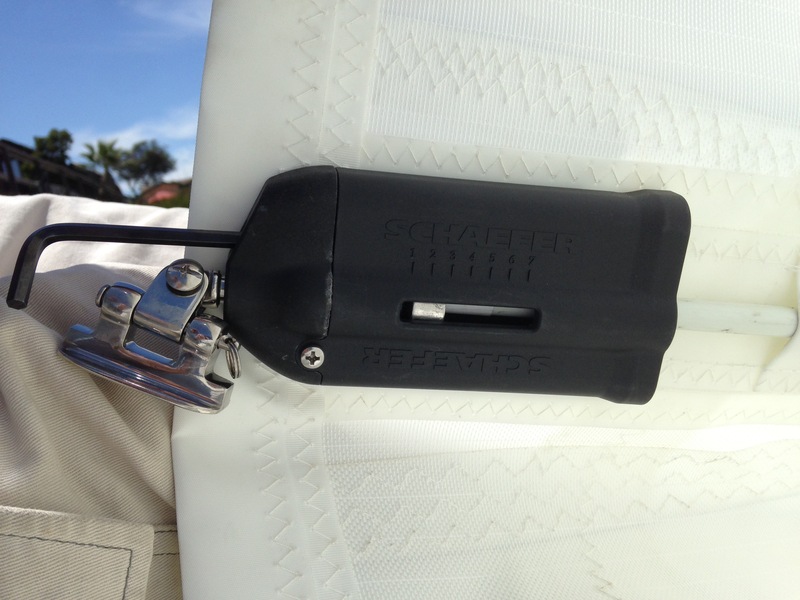 Essentially this setup combines the traveler and main sheet into one tool. You can tension either end of the line and pull on the crossover segment to travel the boom windward or leeward. We’ll find out of the traveling is possible by hand or not. 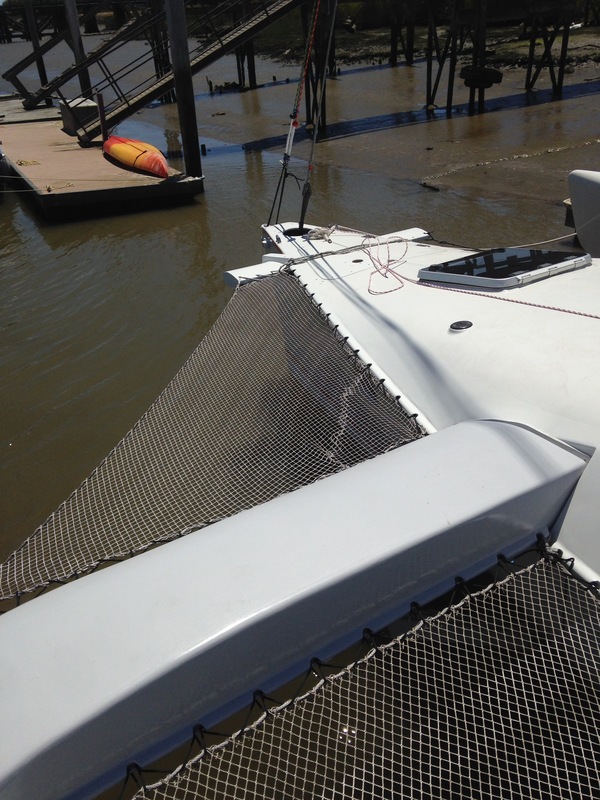 By Sunday afternoon the rig was ready for sails. We unboxed the main (sat a year in the garage!) Holy Cow is this beautiful, heavy duty work. Huge thanks again to Skateaway Designs for engineering all this. 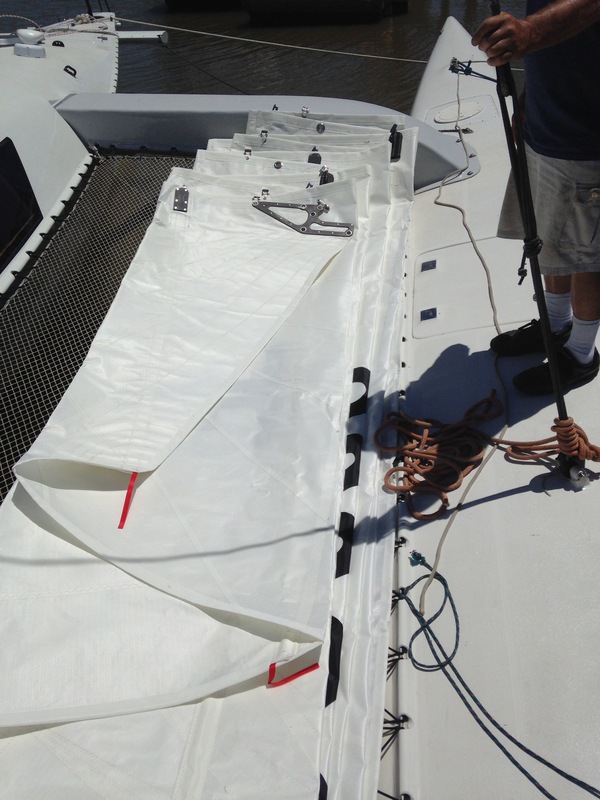 Charlie and I installed the battens and figured out the sail track. Look at these beefy Schaffer cars. That Allen wrench in the first photo is batten tension adjustment. Happy it’s at the mast easy to get to (our past sails have always been out on the leech). We were ready to hoist just as the afternoon land breeze kicked in. After a brief moment of “we can do this” reality of this 47′ tall sail set in and we wisely postponed til the next windless early morning I can get back to the boat. Another big item pre-sail is a steering gear change. Bottom line is I ‘over designed’ the tiller to steering arm connection and it resulted in some play in the steering. I could sense it slightlyin the shop but once underway (by engine last week) we knew this wasn’t good enough. After sleeping on it a brainstorm hit – the design could eliminate a junction by hard-fixing the tiller stub to the steering arm and turning the bearing surface horizontal (using a wide turntable style bearing instead of a boat rudder bearing). 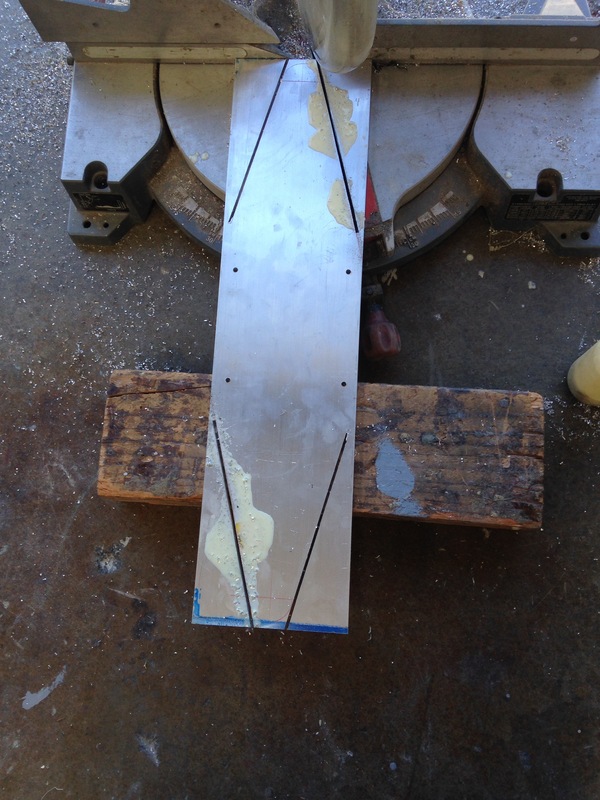 We need to make some new parts in the shop but the base on the boat stays the same. Did a dry-fit Sunday eve and this looks to be a big improvement. 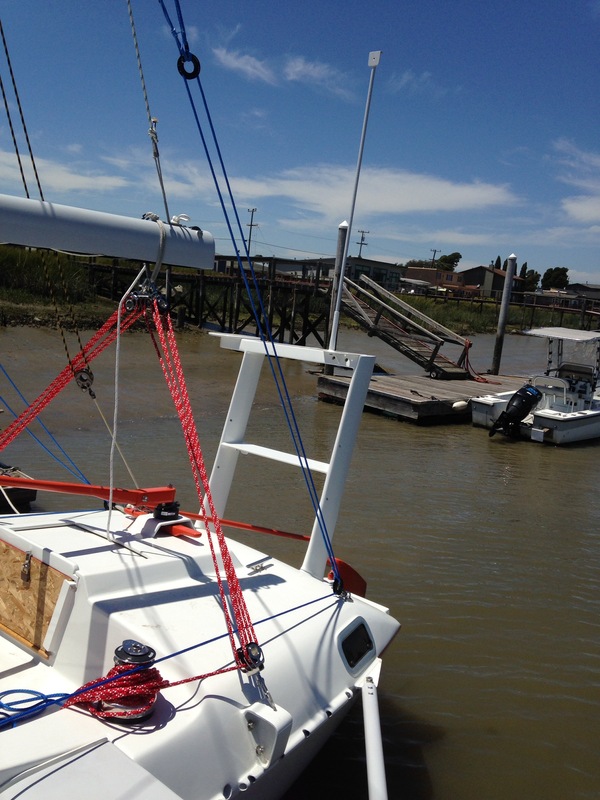 So, we didn’t hit the goal of sailing this weekend, but wth a good push in the evenings this week things should be good for sailing and moving the boat to a new end-tie slip in Richmond, CA for July 4 fireworks. As soon as she’s docked all attention turns to emptying and cleaning the shop for the July 7 handover to the landlord. That will be a huge relief but bittersweet loss of such a handy place to work. Sailin an enjoying soon. Right now it’s still a long punch list of small jobs to finish. Can’t wait to see this flower in full bloom!!! !